If you are a paraglider pilot you are more than half way to being able to fly hang gliders. All your PG experience and knowledge enable you to avoid many common problems when learning to fly. You will be aware of the wind direction and be able to spot good landing options. You already know about the weather and flying conditions, all you have to do is learn to fly the new machine! You start with 2 days flying our school gliders then continue with your own glider with the 4 day CP course completing EP flight tasks as you progress. Successive top to bottom flights improve your accurate flying of a flight plan and enable you to practice the prone flying position. Three soaring flights complete your new rating. If you learnt to fly hang gliders in the flatlands at a tow school you will soon want your hill endorsement.Two days training are initially offered for the HG (hill) rating. Please note, less experienced pilots will need extra days. Newly qualified tow or aerotow pilots start with the full CP (hill) course of four days. Soaring flights can be completed with club coaches. Hill flying liberates a tow pilot from airpark restrictions and launching fees. 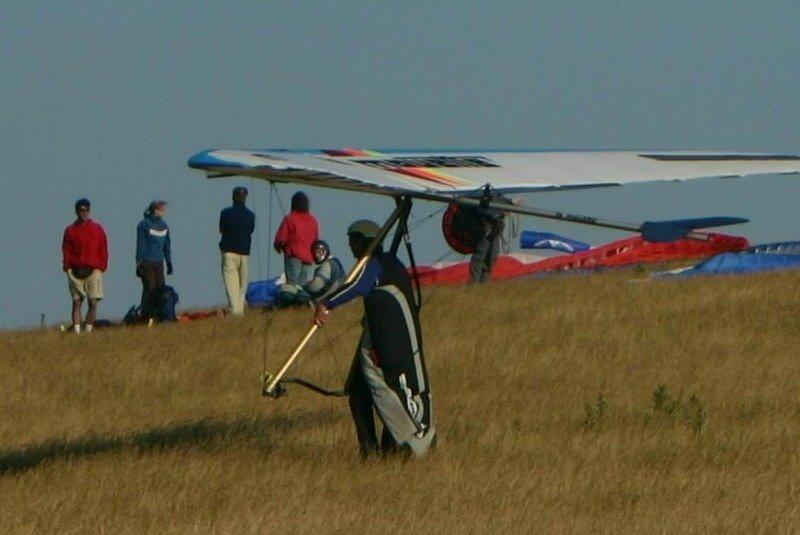 South Downs Hang Gliding is a founder member of our local Southern Club aerotow group. We have an excellent microlight tug which gives a fast climb rate but does so at a low airspeed. Very beginner friendly. Courses are arranged on demand. The minimum entry qualification is BHPA "Pilot" level and sufficient experience on an aerotow suitable glider. Contact us for Aerotow conversion courses.